Sharpening stones are available as synthetic Japanese waterstones, natural Japanese waterstones, oilstones and diamond »stones«. Furthermore, a distinction is made between the following types of sharpening stones according to their intended use. Coarse-grained grinding stones for high material removal, repairs, nicks and changing the bevel angle. Grinding stones with medium grain for sharpening dull blades. Finely grained grinding stones for removing the burr, polishing and honing. Grinding stones with two different grits. How can I learn to sharpen correctly? Nothing goes right without a keen cuttung edge! The best cutting tool is of little use if it is not properly sharpened. How to sharpen a dull cutting edge is a matter of some debate amongst experts, and their opinions often lie far apart from each other. We recommend the technique proven over centuries for the sharpest of all cutting edges, the Samurai sword: Manual sharpening on waterstones. Sharpness is defined by the quality of the intersection of the two bevels which meet at the cutting edge. Dull blades show a rounding at the cutting edge. Sharpening is therefore concerned with the precise abrasion of material on the bevelled surfaces in order to obtain a perfect cutting edge again. 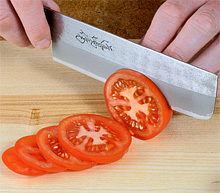 If you can slice a ripe tomato with only the weight of the knife and if no losses arise or can be seen due to squashing, you can consider the sharpening procedure successful! The greatest challenge for a woodworking tool is always the working of end grain. Only truly sharp chisels or planes leave perfectly smooth crosscut surfaces. Tips and tricks for sharpening. One-day workshops / Combined workshops. 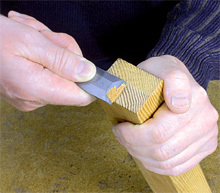 Experts trained by Japanese sharpening specialists give your cutting tools breathtaking sharpness. These are the preferred and most effective stones. They have an open-pore texture with homogeneous particle intercalation, grind quickly, and should be trued when wear sets in. A new variant is the ceramic waterstone, with particularly high resistance to wear, for professional applications. Japanese natural stones, as well as Belgian sharpening stones or the Slovakian Rozsutec are all based on sediment or limestone with intercalated corundum, oxides, quartzite, or semi-precious stones (e.g. garnets). Due to their slightly inhomogeneous structure, these harmonise well with hand-forged steels. Above all, the Japanese and Belgian stones are becoming increasingly rare. The Arkansas oilstones are very dense and wear-resistant novaculite. They are well suited to finishing wood carving and turning tools. Note: Do not combine oilstones and waterstones, as oil counteracts the effect of waterstones. With these sharpening devices, the diamond granulates responsible for the sharpening effect is embedded in a nickel matrix as a thin layer on a metallic base. These stones ensure a high degree of smoothness and long life, provided that the diamonds are of high quality (mono-crystalline). Attention: Avoid low budget products, as these are mostly made of (short-lived) poly-crystalline diamond dust. For frequent sharpening and repairs, a water-cooled machine is advantageous. Finishing stone with grit 6000 (No. 711003) for polishing and removing burrs. The grit describes the fineness of a grinding agent. In Europe, it is defined as the number of meshes per square inch of a sieve. Thus, for example, a grinding agent of grit 500 just barely passes through a sieve with 500 meshes per square inch. Occasionally, the grit is also expressed in terms of the grinding particle size in microns (= 1/1000 mm). One uses stones of grit 80-220 for roughing out (coarse shaping, repairing nicks and chips), grit 800-2000 for sharpening, and grit 3000-12,000 for finishing and polishing. Sharpening stones are always comprised of a binding agent (matrix), in which the grinding particles (aluminium oxide, carbide, natural semi-precious stones, diamond dust) are embedded. The effectiveness of the stone depends on the combination of hardness of the binding agent and the quality of the grinding particles. As binding agents, claylike substances, the hardness of which can be determined by the composition and the baking temperature, are used with synthetic waterstones. With most Japanese stones the binding agent is relatively soft and open-porous. During sharpening, fresh grinding particles are continuously released, achieving a high level of effectiveness. The wear resulting from this process makes the regular trueing of the stone necessary. By comparison, ceramic stones possess a very hard binding agent and little wear. In order to obtain good sharpening performance, however, the use of high-quality, wear-resistant grinding particles (such as with Shapton) is required. In the extreme case of a completely rigid binding of the grinding particles, and thus virtually no wear of the stone whatever, diamonds are used as grinding particles (DMT). Why not tool sharpening steel? This serves only for the removal of burrs from conventional kitchen knives up to a hardness of 58 Rockwell. A tool sharpening steel does not sharpen. Tool sharpening steels have a hardness of 60 to 70 Rockwell. They would only scratch Japanese blades or glide use lessly over the surface. For this reason, we do not offer tool sharpening steels in our programme. Even after sharpening, every blade still requires proper care. For the prevention of rusting, use an acid-free rust-protection oil, e.g. camellia oil (No. 705280) or Ballistol (No. 705270). For the cleaning of dull or oxidised surfaces, we recommend Gundelputz polishing paste (No. 705262) or Uchiko polishing powder, and for the removal of rust the rust eraser (No. 711162). For the safekeeping of synthetic stones, we recommend enclosing them in a plastic container, in which the stones can be kept in a water bath at all times. In order to prevent the formation of algae, add a splash of vinegar or disinfecting agent to the water bath (caution: aggressive household cleaning agents can attack the binding of the stone). Never subject the stones to frost - danger of cracking! With water having a high calcareous content, it is necessary to prevent frequent drying out, as the stones would then adulterate, causing a deterioration of their effectiveness. Handle the stones with care. Keep them flat, clean and oil-free (oil prevents the uptake of water and reduces the grinding effectiveness).